With more than 200 establishments dishing up culinary delights to suit every taste and budget, Whistler’s food scene rivals the best of many North American cities. But when you’re only here for a few days, choices have to be made. So we’ve tried to make it a bit easier with our list of the top 10 places you’ve simply got to try for dinner while you’re here. Bon appetit! The “après” scene at Whistler Blackcomb is the envy of mountain resorts everywhere and there are some undeniably great choices for the perfect end to your day on the mountains. 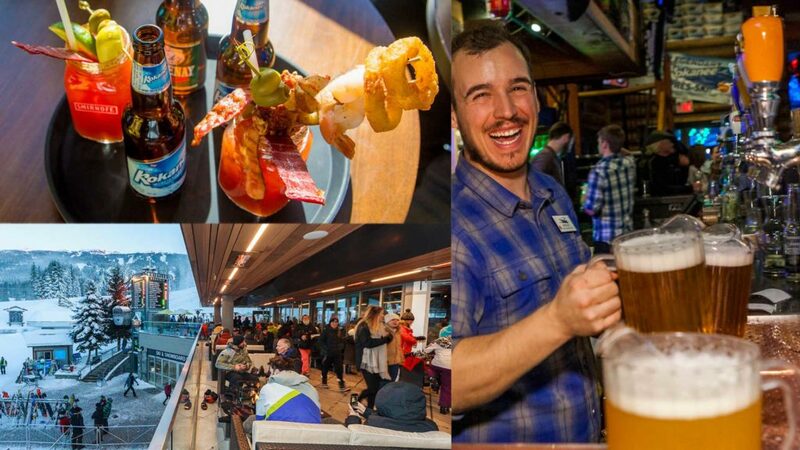 Merlin’s Bar & Grill at the base of Blackcomb Mountain is a perfect combination of laidback mountain décor and the spirited vibe of an old-school rec room party – fun, loud and fabulous! World-renowned as “the” place to après, the Garibaldi Lift Company/GLC lounge bar (kid-friendly until 8pm) boasts a prime location above the Whistler Gondola building, overlooking skiers cruising down the slopes of Whistler Mountain (and bikers charging full-throttle from the Whistler Mountain Bike Park in the summer). When you’re over at Creekside, Dusty’s will lure you in with mouthwatering BBQ, arguably the world’s best Caesar, a legendary après, party rockin’ live shows and is open every day 11am ’til late. Choices, choices, choices! With a long-standing tradition as one of Whistler’s top fine-dining restaurants, Araxi is a culinary tour-de-force that must not be missed (over 90% of its Tripadvisor reviews are Very Good-Excellent; impressive indeed!). Start your evening in the incomparable ambience of The Bar at Araxi and its deservedly popular oyster bar. 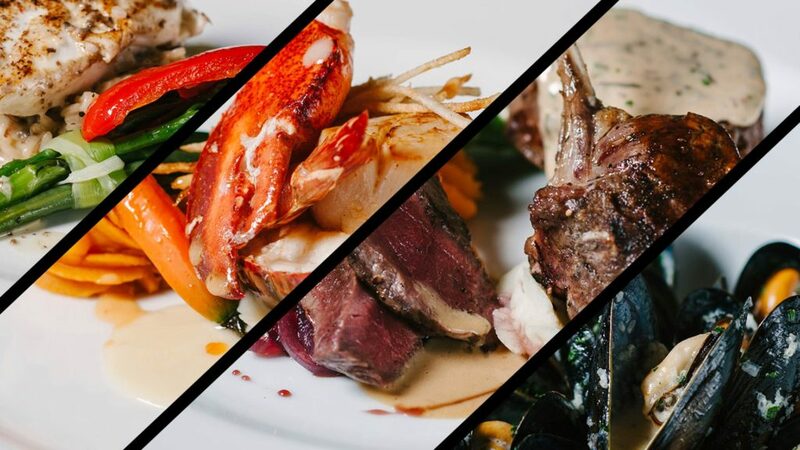 Then indulge your culinary fantasies with the best of Pacific Northwest cuisine, from superbly prepared beef tenderloin, divine alder-smoked Arctic char or handmade pasta with wild prawns, scallops, and mussels. Definitely a Whistler highlight. If you’re in the mood for an elegant French-style bistro that never fails to impress (did I mention it serves Dom Pérignon by the glass! ), put the Bearfoot at the top of your list. Canadian-inspired menu choices change daily to accommodate the freshest seafood, produce and meats available and may include anything from a rack of wild caribou and breast of Quebec Muscovy Duck to pepper-crusted elk carpaccio and steamed Dungeness crab. While you’re here, be sure to visit the underground wine cellar surrounded by over 20,000 bottles of the world’s best vintage and learn about a tradition that dates back to the Napoleonic era, when cleanly sabering the top off a bottle of Champagne meant good luck in the battle to come. Pick your favourite bubbly and create your own luck, saber in hand. Top that off with live jazz music on most weekends, Bearfoot Bistro could become one of your favourite Whistler memories. 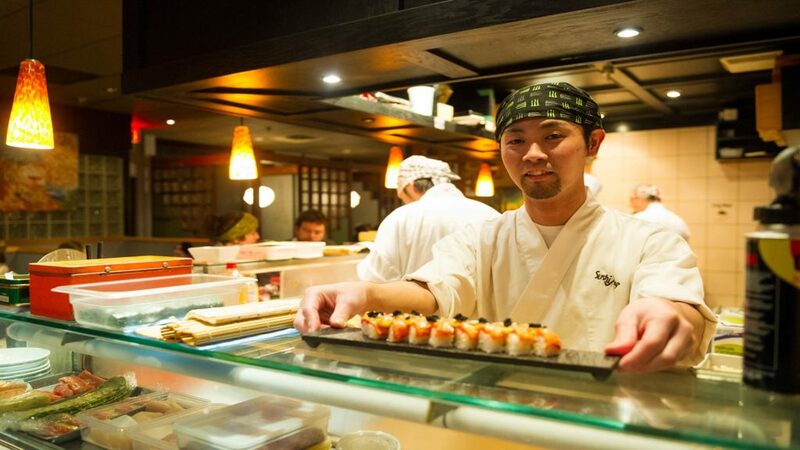 With a tradition that stretches back over 30 years, Sushi Village has become iconic within the Whistler dining scene. Known for its casual yet vibrant atmosphere, terrific always-fresh sushi, wide variety of traditional Japanese dishes, and legendary sake margaritas, Sushi Village is as much a social experience as it is a dining one. This place is hugely popular among visitors and locals alike and reservations are accepted for groups of 6 or more. For those in search of fine Italian fare, a charming Venetian ambiance and superb service, Quattro will not disappoint. The cozy dining room exudes a continental style with ornamental ironwork, picturesque tiles, and hand-painted chandeliers. For a splurge try L’Abbuffata, a five-course Roman feast that comes on family-size platters meant for sharing. Other popular dishes include spaghetti pescatore (with prawns, scallops, and clams), pistachio-crusted sea bass, pressed Cornish game hen, and a plate of five pastas for two to share for a reasonable fixed price. Buon appetito! “Times change. Classics remain.”: an apt description indeed of Hy’s enduring legacy of fine dining, inviting atmosphere, and excellent steak. 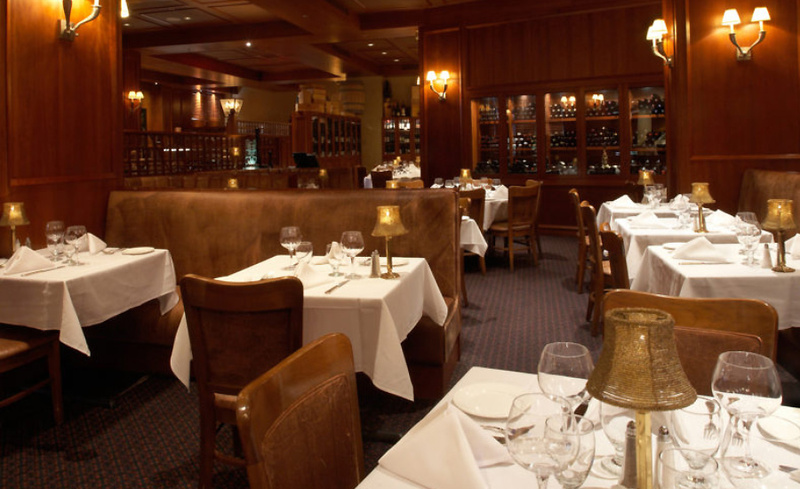 This is the classic steakhouse at its very best. With cozy lighting, white linens, accents of leather and wood details, the stage is set for a romantic or celebratory evening. While steak is the star of the show, all of your favorite classics are on the menu including prawn cocktail, wedge salad, French onion soup, oysters, seafood and other fine meats. 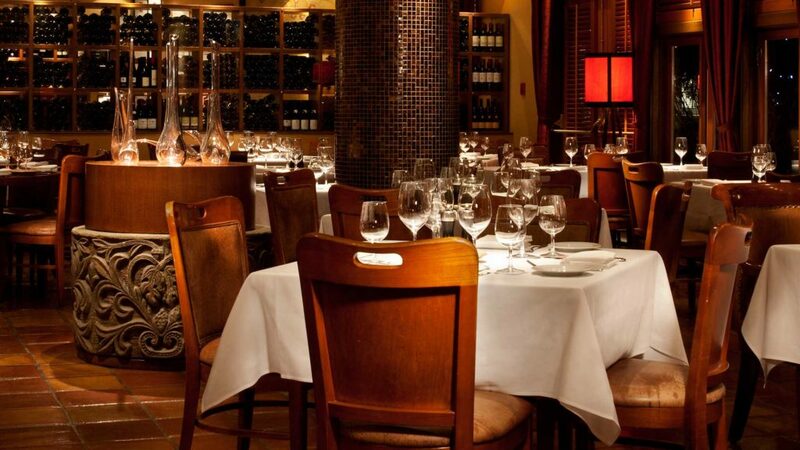 An excellent martini selection and impeccable service round out the quintessential steakhouse experience. For almost 25 years, the Rimrock Café has been a local favorite for atmosphere, service and a sublime eating experience that delights diners with its innovative, fresh cuisine, artfully prepared with inventiveness and flair. Its charming and cozy atmosphere exudes an appealing and rustic elegance that’s so prevalent in mountain resort towns and sets the tone for a beautiful meal. From freshly shucked oysters and seared scallops for starters, to grilled salmon with lobster and duck “two ways” to follow, you’ll want to bring your appetite to the Rimrock Café. If you’re in the mood for a fun dining experience, Caramba! delivers in spades. With high energy service and unmistakably Mediterranean charisma, Caramba! offers an attractively varied menu featuring wood-oven pizzas, west coast seafood, delectable pastas and a great selection of traditional entrées. It’s an instant favourite among diners of all ages and a Whistler family tradition for over 20 years. After an energetic day on the mountains, who could blame you for preferring the relaxing, laid-back dining experience offered at Creekbread? With a focus on “natural”, all meals are prepared with organic produce, free-range chicken, and nitrate free meats and all major ingredients are made in-house! 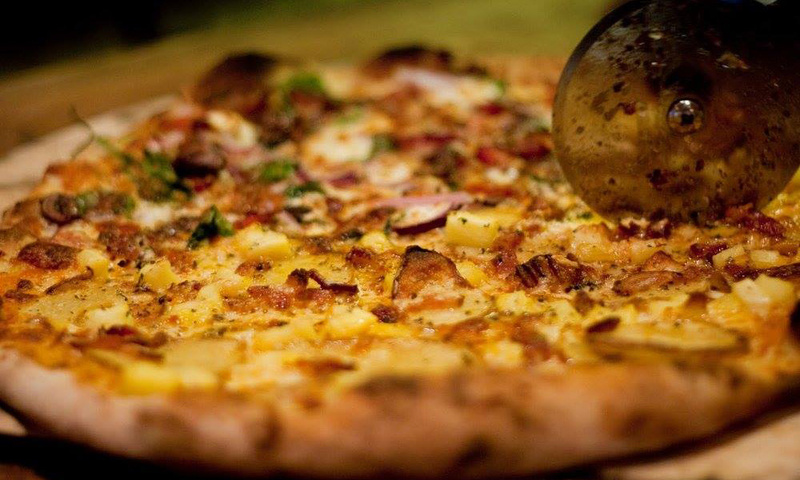 All-natural pizza is the house specialty, cooked in a primitive wood-fired oven – it’s absolutely delicious and a not-to-be-missed part of any Whistler vacation. 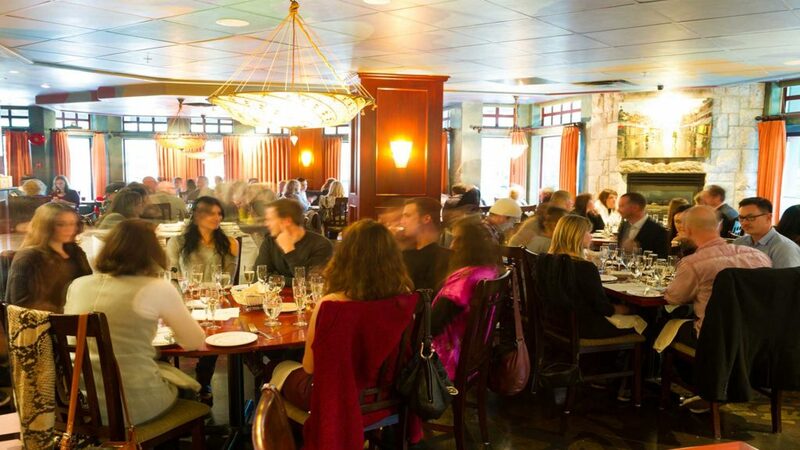 With so many fabulous dining choices in and around Whistler, narrowing down your choices can be a tall order. That’s why Whistler Tasting Tours are a hugely popular choice for so many visitors. 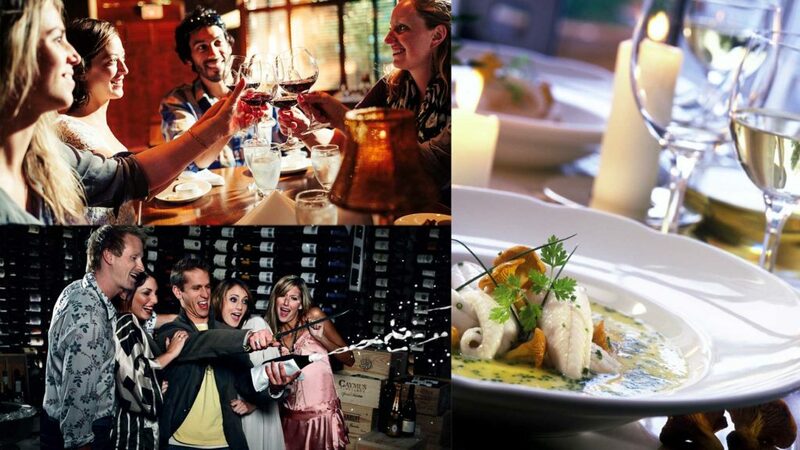 With two tours to choose from, you get to experience a different course of your meal at each of 4 select restaurants. 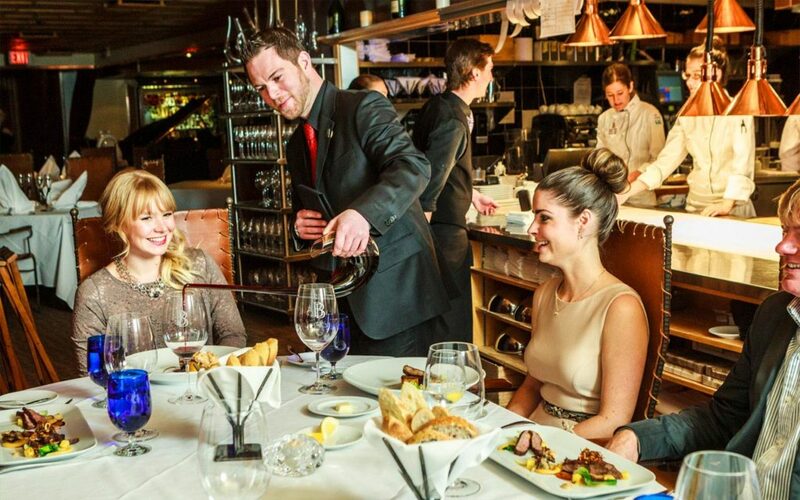 The Finer Things Dinner Tour features four award-winning Whistler restaurants and a visit to an impressive 15,000-bottle wine cellar where guests learn to saber champagne. The Hidden Gems Dinner Tour features 4 delicious courses at four local favourite restaurants, and an olive oil tasting experience. It’s a totally unique experience and a definite Whistler highlight!